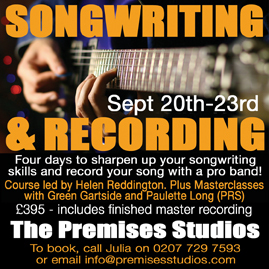 The Premises Studios in London will be running a 4-Day Songwriting and Recording Workshop from September 20th – 23rd 2012. Green Gartside will be doing a masterclass session of about 1 or 2 hours long on one of those 4 days. Helen Reddington, one of the most experienced songwriting tutors in the UK today, is doing the main classes. They also be bringing in the Vice Chair of the PRS, Paulette Long, for a special session on “Making Money from your Song” – an important part of any songwriter’s knowledge. And on the 4th day individual recording slots in Studio A with a top session band are organised for all attendees to record a track they’ve written during the course. The cost is just £395 including the recording sessions. Places are limited to 10 and they expect this to sell out fast. To book contact Julia Craik on 020 7729 7593 or info@premisesstudios.com and please say you read about it on Bibbly!